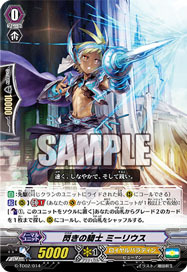 [S] [(R)]: [Put this in your Soul] Choose 1 of your Grade 4 or higher units, and that unit gains +5000 Power and "[A] [(V)] MVP: When this hits a Vanguard with an attack, you may pay cost. If so, Countercharge: (2)" for the turn. [C] [Hand]: When you pay for the cost of Stride, this card gains +2 Grade.